This course gives a step-by-step plan for connecting learning and service to community needs. 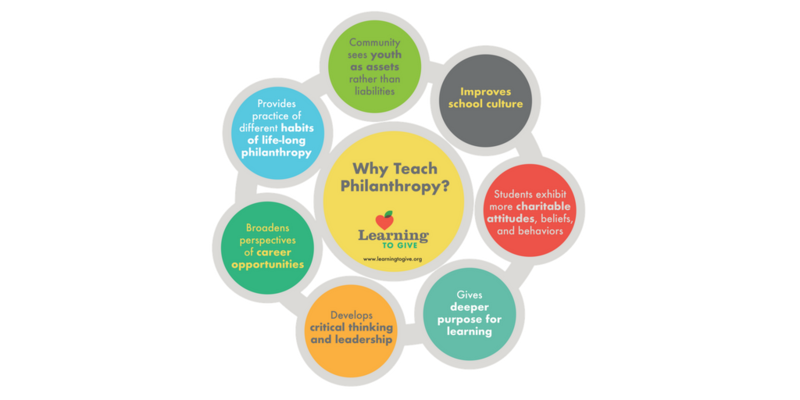 The learner defines philanthropy and the benefits of using class time for teaching students to give their time, talent, and treasure in connection to learning and community. Learn tips and tools to find lessons, project ideas, and training and connect to other teachers across the country. gain tips and tools for using Learning to Give resources. identify the goals of philanthropy education and service-learning. name the benefits of teaching philanthropy and service. learn to connect academic learning to community needs through the service-learning process. reflect on personal experiences with volunteering. Do you know what your students care about? Through discussion and relationship building, you will get to know your students - what they care about, their interests, and what they are good at. These are the things that are going to make your year of Learning to Give successful. Here are some tools and suggestions to find out what kids care about so you can transfer ownership of learning from teacher to student. When you know your students' interests and strengths, you can facilitate meaningful opportunities to inspire them toward action. When learning and service are meaningful and connected to what they care about, the students feel ownership and take on more responsibility. Put them at the center of giving to facilitate pride in making a difference. Service-learning is a strategy that allows the teacher to put the responsibility for connecting learning and service in the hands of students. This section illustrates the service-learning process with a few classroom stories.